Last Thursday my computer was almost completely destroyed! Yikes. Thankfully, I was able to run a successful GoFundMe to raise money to replace it. I have my new computer (hence my drawing this image and posting this update). A huge THANK YOU to all who helped and spread the word, I don't know what I would've done without you. What I'm still waiting on is an update on my data recovery. 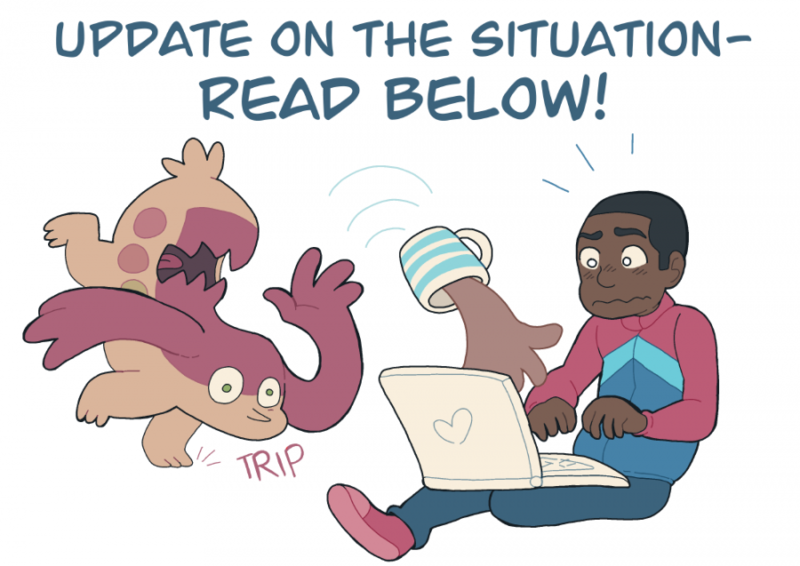 Almost all my important data was backed up (including the Monster Pulse archives, thankfully)- EXCEPT for the last ten pages I had drawn this week. Those unfortunately included the page that was meant to go up after the previously posted one, and constituted my entire five-week buffer. The support store I took my computer to is going to attempt data recovery, but they needed to order a special part to get it done (some kind of chip that was destroyed along with my computer- IDK), and their ETA for that part is the 25th of February. So, I'm waiting until then for some kind of update. Monster Pulse updates will have to wait until then. I'm going to start working on the next chapter to try to get ahead of it, but I can't post the pages that were supposed to go up until I know they can be recovered. If they CAN'T be recovered, I'll have to redraw them. That's the worst-case scenario at this point (could be worse, I'm very lucky, but I'm still crossing my fingers I won't have to redraw). If that's the case I'll have to ask for your patience.